It was already midday when I entered a picturesque bay dotted with islets. The water was calm and black -- the bay was asking to be photographed. However, the tide was high and I had to press on if I were to get up the creek at bay’s end before the shallows and the rapids would make it totally impassable. Paddling up the creek, against the current, I squeezed through several shallow areas, likely impenetrable at low tide. The tide was already ebbing when I got through the last shallow, against a powerful flow, finding my way between large rocks, some exposed, some submerged. This rapid was likely completely impassable except at high tide. Even now, there was barely enough water to get my kayak through without scratching the bottom or getting wedged between the rocks. The current had eased and I entered a narrow valley, where the creek expanded into a lake covered with small grassy islets. 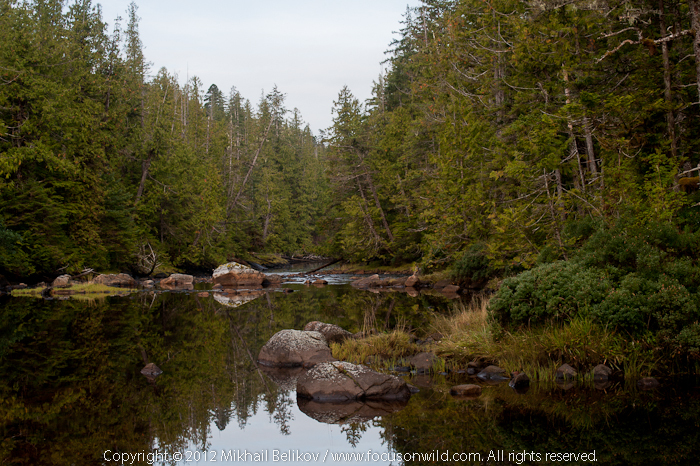 I was moving ahead very cautiously: the water was shallow and logs, branches and rocks were visible beneath the surface. I had almost reached the other end of the lake when a movement some distance away caught my eye. 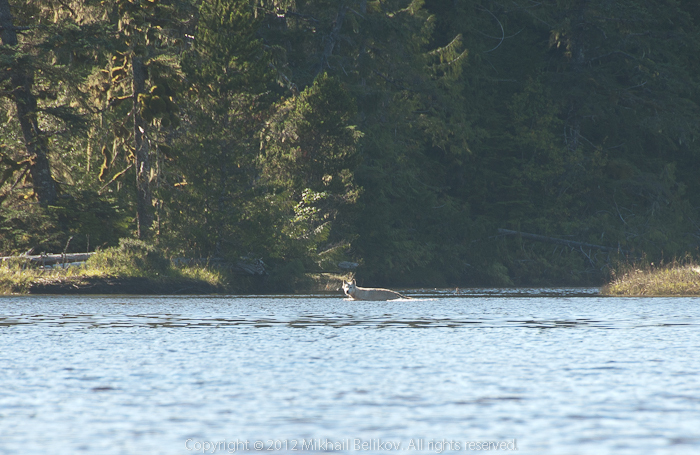 A gray animal was crossing the lake, moving through the shallow water from one inlet to another. Based on the size, this could only be a wolf! 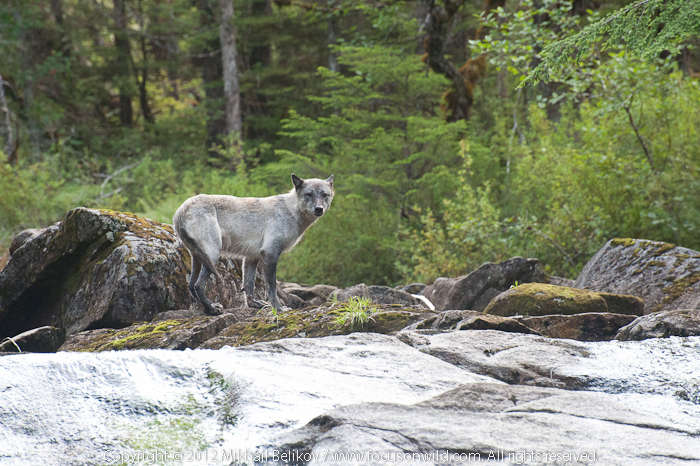 As soon as the wolf saw me, instead of running away it rushed a few steps toward me, paused as if to get a better look and remember all the details, and then completed the crossing disappearing into the forest. Almost immediately, a howl reached me from the shore, soon picked up by the rest of the pack on the opposite side of the lake. For a while, the howling was going on. 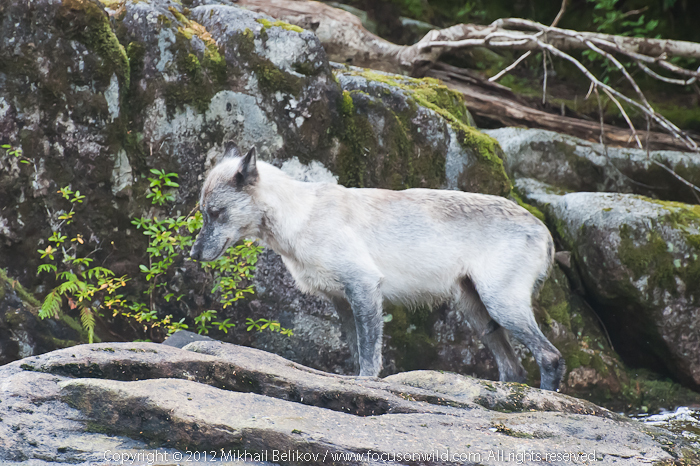 Judging by the sound, the separated wolf was moving ahead of me along the shore, toward the rest of the pack. Soon, with the pack reunited, the sound reached a new high. I had a strong feeling that they were telling me in no uncertain terms that I was an intruder trespassing on their land, and that I was not welcome. I explored the rest of the lake searching for a creek entrance and found that I could not continue up the creek any further: it ended with a waterfall. I started looking for a campsite on the lake. Soon, I found a large grassy islet with a small patch of trees at its highest point, and a flat area among them, just enough for my little tent. Old bear poop in the area reminded me to keep my food well away from the camp. After settling down and enjoying a well-deserved dinner, I fell asleep in anticipation of a day ahead. Over the next few days, I explored the lake shore and the creek above the waterfall. Apparently, the grassy islets were actually deposits of rocks and silt covered with soil and overgrown with tall grass. The grass was hiding nasty holes between the rocks, some at least waist deep. An animal trail from the waterfall and up along the creek was well-developed, with frequent deposits of bear poop indicating its current user. This good trail ended at a large slippery log crossing the creek, with water rushing below. 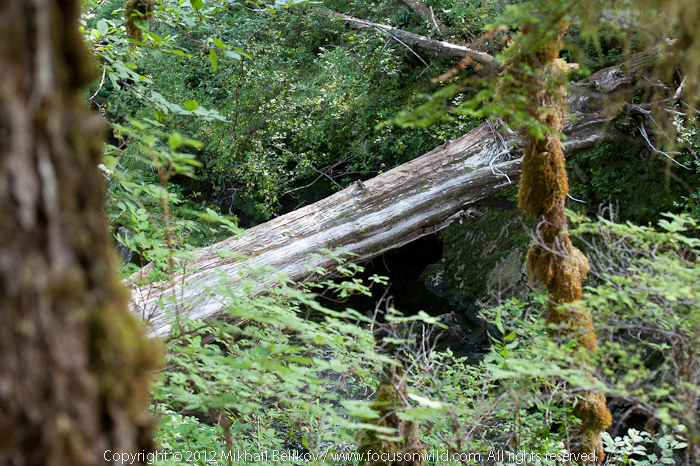 I would have used this natural bridge to cross over, if I had claws like a bear. I did not, and so I returned to the waterfall. 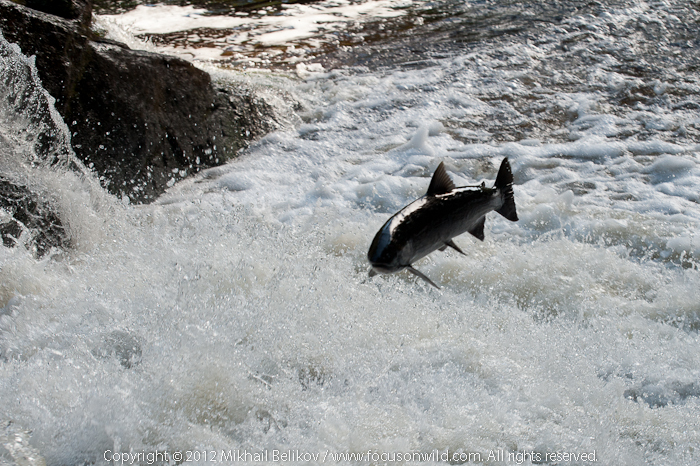 Coho salmon was jumping up the creek, trying to get through the waterfall, and I spent some time observing and photographing, never stopping being amazed by their determination. At some point, I was sitting on a log on a shore, with another log in front of me, used as a support for my camera. I had not realized at that time that I was almost invisible behind the log. Suddenly, something large and gray jumped in front of me: a wolf! Somehow, it did not see, smell or hear me: most likely, water rushing through the waterfall had overpowered other noises, while my smell did not spread in the air saturated with moisture. 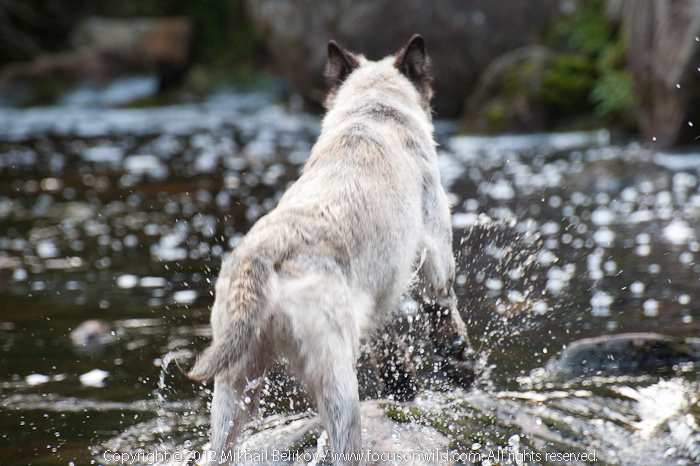 The wolf crossed the creek in front of me and started exploring the water, checking pools for stranded or hiding fish. With its tale between the legs, it looked like a submissive animal, definitely not head of a pack. I kept photographing, and after a couple of minutes the wolf had finally noticed me. No rush to run away: same as the wolf I had met before, this one took its time to check me out, then moved into the forest and soon the pack's howl spread all over, overpowering even the waterfall. 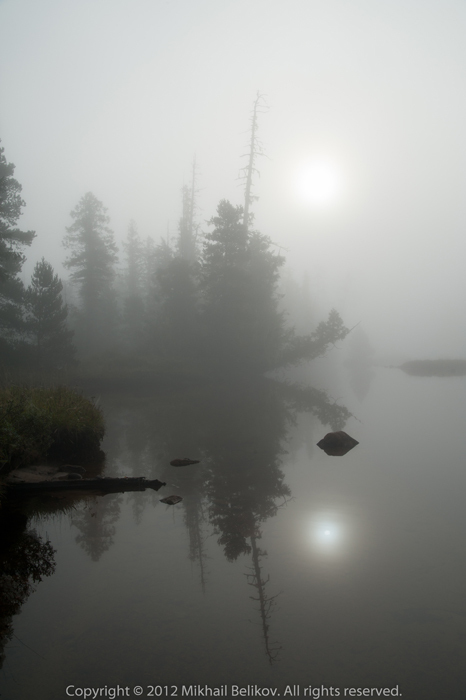 Next morning, the nature treated me to a beautiful dense milky fog covering all of the valley and creating picturesque images. I had stayed in the area for a couple more days, hoping to meet the wolves again and record their howling. Unfortunately, I did not get a chance to see them, although was hearing the howling from time to time, at a distance, too weak for a proper recording. I have visited the valley again. No wolves, although the signs of their presence, headless carcases of salmon, were all along the creek. At the end, I had given up, packed up and was ready to depart when I had finally heard a lonely wolf in the bushes, likely no more than 30 meters away. Apparently, this time the wolves had not been aware of my presence until this animal discovered me and alerted the pack. The voice was near and clear, and I had recorded this farewell message from the masters of the Valley of the Wolves. Copyright © 2012-16 Mikhail Belikov. All rights reserved. © All text, photographs and sounds on this site are the property of Mikhail Belikov, unless stated otherwise. They are protected by the copyright laws and are not to be copied, downloaded or reproduced in any way without the written permission of Mikhail Belikov.